National Tartan Day on April 6th is a Scottish heritage celebration in the United States that brings to remembrance the Declaration of Arbroath proclaimed and signed in Scotland on April 6th, 1320, and the designation made by US Senate, declaring April 6th of each year as National Tartan Day. The main capitals in the US celebrate Tartan Day, and communities of Scots and Scottish descendants in countries like Australia, Argentina, Canada and New Zealand join the celebration. In the US, the NYC Tartan Parade is the biggest Scottish parade and the main attraction of the New York Tartan Week. The 20th New York Tartan Day Parade 2018 will be held on Saturday, April 7th in NYC on 6th Avenue from 45th to 55th streets. At the NYC Tartan Week, bagpipes bands, Highlanders, dancers give life to the Scottish celebration. Scottish food like Haggis neeps and tatties, Steak pies and Shepherd’s pies accompanied by a glass of Scotch Whiskey and shortbread as a sweet treat are the favorites among attendants. 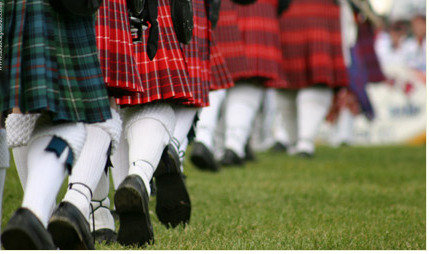 Although kilts are mostly worn by bagpipers, drummers, highlanders dancers, and performers at the Scottish Tattoo and related events; Scottish-American who keep track of their clan's history wear proudly their kilts at tartan day. Some Scottish clan names include Abercromby Clan, Agnew Clan, Anderson Clan, Baird Clan, Bannerman Clan, Boyle Clan, Bruce Clan, Campbell Clan, Carmichael Clan, Carnegie Clan, Davidson Clan, Ferguson Clan, Gordon Clan, Houston Clan, Johnstone Clan, Lennox Clan, MacDonald Clan, Pollock, Ramsay clan, Russel Clan, Stewart Clan, Wallace Clan, among others. Tartan Day is about celebrating Scottish culture and the contributions made by Scots to the United States along history; those historical contributions helped to shape the American society and the United States development.